Everything is oddly laid-back in The Descendants, an adult and somewhat depressing drama set in Hawaii. 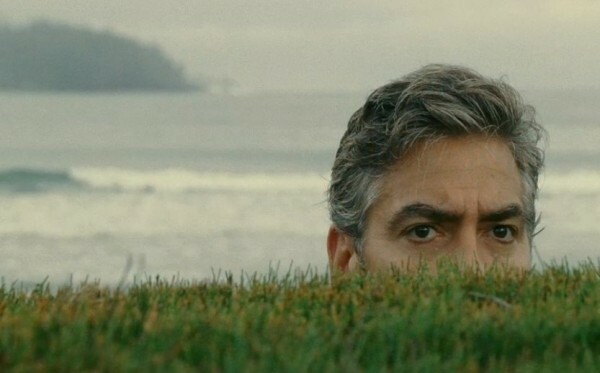 George Clooney is Matt King, a soon-to-be widower. His wife Elizabeth, who has been in a speedboat accident, lies in a coma; she is not expected to recover. He discovers that she had been having an affair with a callow realtor (Matthew Lillard). He is also the trustee of thousands of acres of pristine Hawaiian land; he is being subtly pressured to sell to a land developer, because his many cousins would like some money. All of this unfolds against glowing island backdrops. At the beginning, Matt complains in narration that heartbreak can and does happen in “paradise,” and indeed it seems almost churlish to give in to despair and anger in such soothing climes. Matt holds it together, barely. He doesn’t understand his two daughters, especially his 17-year-old, Alex (Shailene Woodley). He tries to be strong for them, to be the father he hasn’t been lately (he’s a busy lawyer). George Clooney has a way here of seeming most authoritative when Matt is at his most baffled and insecure. We never see Matt at ease — we’re tossed into his crisis right at the start — and he’s always roaming around the islands, looking for answers. There’s no enforced conflict in the movie; people talk, working their way through awkward moments. Director-cowriter Alexander Payne, working from a novel by Kaui Hart Hemmings, has left the venom of his past films (Citizen Ruth, Election, About Schmidt, Sideways) far behind. Payne is generous to everyone here, even the realtor, who gets a scene of sad realization that almost single-handedly redeems Matthew Lillard’s past crimes. The lightness of the surroundings doesn’t exactly mock the heaviness of the emotions; Hawaii just seems like the calmest place in the world to have a nervous breakdown, and it helps if you’re quite well-off and possibly soon to be even better off. On the evidence, Payne is most comfortable among the moneyed, the better to probe the fissures where their public faces meet their wolf-hour preoccupations. There’s a small risk that The Descendants, in the current atmosphere, may be dismissed as a melodrama about the problems of the rich. (Matt may not be in the 1%, but he’s at least in the 10%.) Usually I sympathize with such charges, but the movie has such a delicate touch in moments like Elizabeth’s gruff father (Robert Forster, still great at age 70) speaking gently to his Alzheimer-stricken wife or visiting Elizabeth’s bedside that the universality of grief — we all endure it, those clad in silk and denim alike — is strongly underscored. Along the way, Matt’s every advantage is turned against him. His money might have saved his wife; less devotion to his job could have saved his marriage. All that land is just a headache, and bringing up two daughters in paradise guarantees no happiness for them. Deservedly, Shailene Woodley, who just turned 20, is about to become a lot better-known. (She currently stars in the ABC Family show The Secret Life of the American Teenager, unwatched by me.) Her Alex is screwed up in some ways, mature beyond her years in others, and Woodley shows us the link between the two. She’s the real soul of the film, which otherwise attends to Matt’s various crises. The Descendants is being marketed, rather misleadingly, as a comedy; the ads are packed with crude humor beats such as the gruff father-in-law decking Alex’s oblivious boyfriend, when in fact the punch emerges from genuine rage, the emotion Matt never quite allows himself. Meanwhile, Elizabeth lies unresponsive in her bed, growing more gaunt with each scene, provoking sorrow and anger in roughly equal measure; the film tries to outdo Last Tango in Paris with not one but two bitter one-sided deathbed confrontations. (The second is probably unnecessary but gives Judy Greer, as the realtor’s wife, some good material for her highlight reel.) Ultimately, the film is about how everyone resolves his or her feelings about this insensate body wasting away in paradise — sort of like a shotgun marriage between Jimmy Buffett and Harry Chapin. In Breaking Dawn — excuse me, The Twilight Saga: Breaking Dawn Part 1 — we receive copious data on what befalls a human woman carrying a vampire’s child. The baby will grow at a terrifyingly fast rate, it will monopolize the host body’s nutrients and leave none for the mother, and finally it will break her ribs, pelvis and spine in its short, superhuman stay in the womb. I was reminded of Larry Niven’s deservedly notorious essay “Man of Steel, Woman of Kleenex,” which enumerated the practical reasons why Superman could never enjoy carnal relations with Lois Lane. Edward Cullen (Robert Pattinson), the sparkly vampire betrothed to mopey human Bella Swan (Kristen Stewart), must have read that essay; he has spent the last three Twilight films worrying that, should he ever fall upon Bella in lust, he would break her, or something. On their wedding night, Edward resolves to be extra super gentle, but in the morning Bella is still tattooed with bruises and the pillows have been all bitten up. Edward knocks Bella up first time out — way to go, dude! — and Bella, now occupied by a super-baby killing her from within, starts her long, romantic dissipation into death. The Twilight series has been drenched in the peculiar insanity of repression all along, but in Breaking Dawn it reaches a fever pitch. Apparently, even if you do everything right and marry your forbidden boyfriend before you bed him, you will still suffer nightmarishly. Bella, however, doesn’t seem to suffer much, though computer effects render her skeletal; maybe it’s just that Kristen Stewart can’t bestir herself to portray agony any more than she could depict love, anger, sadness, wanting a sandwich, anything. At this point it’s hard to tell whether her blankness in the role owes to shrewdness — intentionally giving teenage female fans a void onto which to project themselves — or simply to boredom with the material. If the latter, she should thank Stephenie Meyer, who penned the Twilight novels, for only writing four instead of seven, like J.K. Rowling. For long stretches of Breaking Dawn, we could be forgiven for forgetting that Edward is even a vampire; mostly he frets and dithers, resulting in Robert Pattinson’s dullest performance in the series, despite Edward’s finally gaining some physical satisfaction. Bella is slipping away from existence by the minute, and all Edward and his fancy vampire clan on the outskirts of Forks, Washington can think to do is stand around and occasionally offer her a Slurpee cup full of blood. The hot-blooded werewolf Jacob (Taylor Lautner), who also loves Bella, takes over the movie by default; he’s the only one who takes any initiative to do anything. I’ve always been Team Jacob — give me the lower-income Native American shape-shifters over the bloodsucking aristocracy (Occupy Forks!) — but it’s a pity about Taylor Lautner, who on his best day makes Kristen Stewart look like Maria Falconetti. The main problem here is that, aside from its many bizarre elements, the film feels like the prelude to the more interesting finale that Part 2 promises to be, what with Bella now vampirized and feeling her new powers. If that doesn’t goose Kristen Stewart into moving that angular granite she calls her face, I don’t know what will. We will also have a run-in with the Volturi, the elitest of all elite vampires, and the continuing saga of Jacob’s “imprinting” on Bella and Edward’s baby daughter, who has been graced with the perfectly ghastly name Renesmee. If you hear of any impressionable Twilight fans who have actually named their defenseless babies Renesmee — or Edward Jacob, for that matter — please keep this to yourself. In Melancholia, which has just gotten a theatrical release after a month of playing on cable on-demand, it’s the end of the world as we know it and Kirsten Dunst feels fine. It’s about the only time she does feel fine. As Justine, an unreachably depressed young woman, Dunst takes her place alongside a gallery of other female sufferers in the work of writer-director Lars von Trier. Like those others, Dunst puts in a career-best performance, sinking under the weight of self-lacerating despair. Justine’s condition is never explained, as it often isn’t explained in life (although her parents are played by John Hurt and Charlotte Rampling — there’s a big clue right there). In the movie’s first half, she gamely tries to slog through her wedding party, and the people closest to her, like her sister Claire (Charlotte Gainsbourg), know full well how much work goes into each empty smile. That the world ends in Melancholia — extinguished by a rogue planet also called Melancholia — is revealed in the opening moments; we get squished to the prelude to Wagner’s Tristan und Isolde, which recurs throughout the film as the wayward green ball in the sky draws closer. After that, we endure the wedding party, held at the sumptuous country house of Claire’s filthy-rich husband John (Kiefer Sutherland), who fancies himself an armchair astronomer. Justine has married Michael (Alexander Skarsgård), a well-meaning dud who comes off as though Andy from Parks and Recreation had wandered into an apocalyptic art film. He doesn’t last long. In the second half, Justine, having shed Michael and most of what’s left of her sanity, is living with Claire and John and their little son. As Melancholia bears down, the formerly stable Claire grows more and more frantic — John assures her the planet will harmlessly pass by, but she can’t bring herself to believe him — and Justine seems more and more placid. Her life is already over. Global death is just a formality. Von Trier went through a period of depression a few years ago, and he worked it out in his previous film, the notorious Antichrist, in which nature seemed charged by grotesque and demonic energy. Melancholia is something of a bookend piece, equally gorgeous, not nearly as physically appalling, but almost as disturbing. It’s not a “horror movie,” exactly, but few images at the movies this year have been as frightening as the view of Melancholia growing larger in five-minute intervals through a handmade planet-viewer. At heart, it’s an epic about response to life and death. John, of course, seeks to master the mystery, just like Willem Dafoe in Antichrist and all the other clueless men in the von Trier portfolio. (The filmmaker gets tarred with the “misogynist” brush a lot, but his men are idiots and his women routinely win his actresses top prizes.) Claire clings to her life so tightly she can’t bear the thought of nothingness, while Justine has burned through despair into a kind of Zen-Buddhist shrug. If Antichrist was written in the throes of depression, Melancholia is a report on the condition after the fact. The symbolism may strike some as a little neat: Melancholia has been “hiding behind the sun,” and then it emerges, blocking out everything else — much like the mood it’s named after. The entire grandly morose film could be read as a suicidal woman’s reverie on her own world ending. (Many depressives, squeamish about taking the final step off the ledge, fantasize about a vast catastrophe that will take their decision and their responsibility out of their hands.) But von Trier’s filmmaking, as always, is elegantly alive, never sodden with the script’s significance. The first half, well-populated by von Trier regulars like Stellan Skarsgård and Udo Kier, tosses in enough eccentricities (what’s up with John Hurt tucking spoons into his jacket pocket?) to counteract Justine’s moping. The second half is sparser and stiller, focusing on the sisters and their emotional preparation for doom. Images may stick with you: a horse falling to the ground in extreme slow motion; Claire attempting to outrace the apocalypse in a golf cart; Kirsten Dunst’s features ravaged by loathing. Those looking for sharp internal logic should look elsewhere. Lars von Trier uses a literal worldwide disaster as a backdrop for a tiny, specific personal story about a woman who’s sick of pretending to be happy and who can’t help throwing everything away, cutting herself off from life so definitively that the end of the world is just the last of a lifelong list of things she can’t control. Giving up the illusion of control has delivered her into a kind of grace. Justine has already died every time the hated sun has risen yet again; soon it will all be over. Von Trier’s plotting isn’t always up to the level of his visuals or his emotionally-loaded philosophizing, but on the increasingly timid stage of world cinema he continues to be a giant among ants. Why do Harold and Kumar have to grow up? Cheech and Chong never did. In A Very Harold & Kumar 3D Christmas, Harold (John Cho) is now a Wall Street shark and Kumar (Kal Penn) sits on his couch getting stoned all day because he’s been disbarred, or disdoctored, or whatever you call it when doctors flunk a drug test. The two haven’t seen each other in years, but fate throws them back together for another anarchic ride. In Harold & Kumar Go to White Castle (2004), their goal was to make it to the eponymous burger joint. In Harold & Kumar Escape from Guantanamo Bay (2008), their very freedom was at stake. Here, their task is to replace a Christmas tree burned down by a giant spliff; they also run afoul of Russian mobsters. All things considered, the boys’ stoned quest for a burger seemed more urgent, somehow. The Christmas tree represents Harold’s desperation to impress his tough-guy father-in-law (Danny Trejo, the idea of whose casting is funnier than he’s allowed to be). The mobsters have to do with a weak subplot in which a friend of Kumar’s wants to devirginize the mob kingpin’s daughter. First of all, this is creepy. Second, the mob boss is played by Elias Koteas, who looks enough like former series mainstay Chris Meloni (who played Freakshow in the first film and a KKK grand wizard in the second) that I kept wondering why Meloni didn’t return for this one, and it took me out of the movie. Third, we spend entirely too much time with Kumar’s friend and Harold’s milquetoast friend trapped in a closet along with the latter guy’s stoned baby daughter. The movie tries for loads of laughs involving the baby getting high on weed, cocaine and ecstasy, then has the gall to be pious about Harold’s desire to have kids and Kumar’s struggle to be mature when his ex-girlfriend turns up pregnant with his seed. And Neil Patrick Harris? He shows up for about ten minutes, doing the usual diabolical-he-man shtick he does in these movies. A scene in which he more or less rapes a back-up dancer in his Christmas stage show isn’t funny, just ugly. (He seems infected by the Kubrick crazy-face as seen on Alex in A Clockwork Orange.) Here, we learn that the farcical NPH in these movies is an aggressively hetero man pretending to be gay so he can get access to trusting women. Harris is, of course, gay in real life, which is what made the bizarro-world NPH in the other films funny, but bringing the real Harris’ sexuality into it kills the joke. Since his screen time is so limited here, too, he doesn’t have a chance to bloom into party-boy insanity, as in the previous movies. He just drops in because he’s expected to. And I keep flashing back to Cheech and Chong. They made good movies and bad, and the bad ones truly contaminated the continent (Chong should’ve been incarcerated not for selling bongs but for Still Smokin’), but I don’t remember them ever stooping to reassuring us that they were really upstanding citizens at heart, who would become family men at Christmastime and give us the warm fuzzies. No, they got wrecked and they screwed up and they were funny. That used to be enough for stoner comedies.